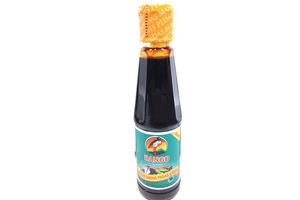 Bango Hot Sweet Soy Sauce (Kecap Manis Pedas Gurih) 4.56fl oz (135ml) bottle. Product of Indonesia. Halal Certified حلال . black soy bean, chili, water, modified starch, garlic, salt, acidity regulatory (nitric acid, acetic acid), yeast extract, caramel color, food preservative (sodium benzoate, potassium benzoate), flavor enhancer (disodium inosinate ) garlic flavor, vegetable stabilizer.